Need To Cancel An Award Reservation That Comes With A High Service Fee? You Might Want To Wait For A Schedule Change! Today we want to remind people who used award miles and have to cancel again for whatever reason that it might be worthwhile to wait and see if there is a schedule change in your itinerary, allowing for free cancellation and refund of the miles. 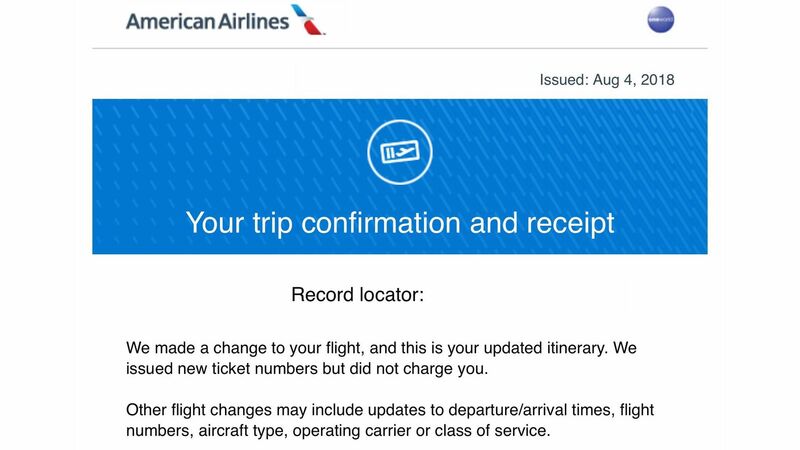 Cancelling and refunding award reservations can (depending on the program) come with a pretty hefty fee of up to U$150 but if there is an involuntary change to the reservation then these fees will be waived. I just had such a case where I received a flight change notification yesterday and was able to cancel the ticket free of charge this morning with all miles being refunded already. The ticket was originally issued by American AAdvantage, 30,000 AA miles for Bangkok-Tokyo-Seoul in Business Class, early April 2018 that I wanted to use for the cherry blossom season. As so often nature didn’t exactly follow the forecast and I actually had to go 10 days earlier. Unfortunately JAL had no award availability so I had to purchase another ticket on Thai Airways. What to do with the mileage ticket? 1) I could always find another occasion to fly this route, likely in October or November this year and could then modify the date again. 2) Should a schedule change occur (very likely considering it’s still one year to go) I could cancel and get the miles back without paying anything. The second scenario came into play this week when I got the email from AA that my ticket has been changed. Seeing my chance I immediately called up American and the agent was very helpful in cancelling the ticket and putting the miles back into my account, no questions asked. In the past I was AA Executive Platinum and could cancel tickets free of charge but since I swapped to British Airways for my main oneWorld membership the AA account is somewhat orphaned. In fact I rarely have any transactions on the account so I even transferred 1 SPG point from time time into my AA account to have an activity for the next 18 months. When this whole cancellation situation happened I had no immediate use for the miles due to lack of availability so it didn’t pose a problem for me to just let the reservation sit there until opportunity arises. Obviously this solution doesn’t work if you want to use the miles immediately or in the very near future, sometimes a schedule change never happens at all so time is certainly of the essence but no guarantee. And this isn’t just valid for award tickets, revenue fares also fall under this protection if you can argue the new schedule doesn’t work for you anymore. The fees some of the frequent flyer programs levy are out of hand considering it’s an automated process that doesn’t involve much manual involvement (ok, with American it does because their website is a disaster). Especially the U.S. based programs are the worst offenders here with their US$150 charge. The European and Asian carriers charge up to US$50/50 EUR for cancellations and redeposit. While I hate wasting money for nothing it’s definitely reasonable enough that I’d have just paid for it and have gotten the miles back. Certainly not for $150 though. Have you felt ripped off by frequent flyer programs service charges?